The UN Special Rapporteur on the Rights of Indigenous Peoples, Victoria Tauli Corpuz, affirmed on Thursday, 8 June 2017, that indigenous rights are under attack in Brazil as the government is continuously implementing measures which aim at weakening the legal protection of indigenous peoples. Ms Corpuz refers in particular to the recent dismantling of FUNAI (Brazilian Indigenous Foundation). In light of Brazil having the world’s highest number of killings of environmental and land defenders over the last fifteen years, the UN Special Rapporteur notes that Brazil should be’ “strengthening [protection] for indigenous peoples” instead of weakening them. Indigenous rights experts, including the United Nation Special Rapporteur on the Rights of Indigenous Peoples, Victoria Tauli Corpuz, stated on Thursday (June 8th 2017) that the rights of the indigenous are being attacked in Brazil. Corpuz added that the current government has approved measures that reduce the legal protection of these traditional communities. According to Corpuz and the other experts Brazil has registered the highest number of killings of environmental and land defenders of any country over the last fifteen years, with an average of about one killing every week. 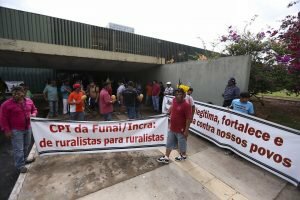 The international experts’ main criticism is aimed at a report of the Congressional Commission of Inquiry (CPI), approved last month and in which 96 people including community leaders, anthropologists and civil servants are accused of fraudulent processes of demarcation of indigenous lands and rural settlements for agrarian reform. The report also calls for the restructuring of FUNAI (Brazilian Indian Foundation) and the revision of already demarked indigenous land. According to one of the leaders of the Kaingang tribe, the Congressional report allows for the extinction of FUNAI as a strategy to end the process of demarcation of the indigenous lands pushed forth by the Foundation. “We, as indigenous people, repudiate the way in which lawmakers are intervening on this issue, especially the rural and agribusiness communities,” said Francisco Kaingang during a protest in front of Brazil’s Congress in May. “The CPI is a way of intervening in FUNAI to end the demarcation process of our traditional lands,” added the indigenous leader.